On Thursday, July 7th, various entities dedicated to the important work of preserving and protecting Belize’s natural heritage presented the Belize Barrier Reef scorecard for 2016. 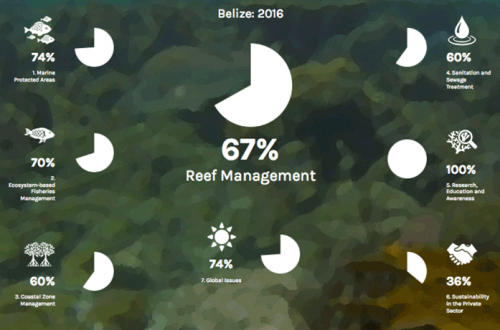 The purpose of the evaluation is to get Belize’s Reef System off the World Heritage Site’s endangered category. The reef system has been on that list since 2009, and according to the results this year much more needs to be done before its removal from the vulnerable category. The Belize Barrier Reef runs parallel to the coast of Belize for about 185 miles and is responsible for 15% of the country’s Gross Domestic Product (GDP). However, this great valuable natural resource is in danger. According to Valentino Shal from the World Wildlife Fund they are looking at all that needs to be done in order to get the Barrier Reef off the endangered list, while at the same time ensuring that it is a healthy and functioning resource. “The indicators of this score card are based on the exact same indicators that are included in the desired state of conservation report that we the World Heritage Committee and The United Nations Educational, Scientific and Cultural Organization (UNESCO) gave to the government,” said Shal. He added that unless the government addresses the issues highlighted in the indicators, the reef will continue to be considered vulnerable. The report card details how effective the Government of Belize (GOB) has been in implementing policies and actions to address the issue. The scores are divided into three points. A score of 1 indicates major concerns; a score of 2 indicates some concerns and 3 means good progress. In the report card, none of the six indicators given to GOB received a score of 3. But five of the six received a score of 2. This is good news to some extent as it indicated that there has been some progress. The indicators that received a score of two were Offshore Oil Drilling, Mangrove Conservation, Costal development and Tourism, Fisheries and Wold Heritage Value. Meanwhile the worst score was regarding Environmental Regulation, which is of major concern. Belize Audubon Society representative, Executive Director Amanda Burgos-Acosta, says that one of the reasons why the reef system is still considered in great danger is due to the little enforcement on development within the World Heritage Site. “It will be crucial to have an Act or Bill that can guide development. That was one of the triggers that actually led to our inscription on the endangered list,” said Burgos-Acosta. At the end of the presentations, the organizers and presenters of the scorecard indicated that in order for the Belize Barrier Reef report to improve, all Belizeans need to do their part. It is everyone’s job to ensure that future generations benefit from this valuable natural resource. They hope that next year the results are opposite to the current ones. The decision to keep the Belize Barrier Reef on the endangered list was made even more official on Tuesday, July 12th during a United Nation (UN) session in Istanbul, Turkey where representatives from 192 countries attended. The UN urged protection for World Heritage Sites and thus, the Belize Barrier Reef will remain to be on the list of World Heritage Sites in danger. The decision was taken after the imminent threats of oil exploration, damaging coastal construction and pollution. At the meeting, Belize was recognized for its commitments to protect the reef by promising to ban oil exploration in the World Heritage Site. However, they asked that such promises be enacted in law. “We are moving in the right direction with this decision, but it’s a long road to ensure that both the reef and the people who rely on it are protected into the future,” said Nadia Bood, a World Wide Fund for Nature- Belize Reef Scientist. Last year, the government of Belize announced a policy intended to ban offshore oil exploration within the reef system and one kilometre buffer zone. This effectively should result in a total of 2,117 KM2 being protected, but leaves 85% of the country’s waters open to future oil extraction. WWF calls for a full ban on all offshore oil exploration and extraction to protect the reef and the livelihoods of 190,000 people which is almost half of the population of Belize who depend on it to make a living. A report produced for WWF by Dalberg Global Development earlier this year found that nearly half of all natural World Heritage sites are threatened by harmful industrial activities, such as oil and gas exploration, mining, large- scale infrastructure projects and industrial-scale logging or fishing. Some of these can be related to Belize and WWF argues that governments should ensure that no harmful industrial activities are permitted in World Heritage sites or in areas that could negatively affect them.